Well, if you haven't already heard, Zumba is the only Latin-inspired, calorie-burning, dance-fitness party that blends hot international rhythms and beats from around the world with easy-to-follow and highly contagious dance moves that will make you want to exercise and improve your health. Hello there, my name is Lucy Heath, I'm 31 years old and a fully certified Zumba Fitness Instructor who works and lives in the Cheltenham and Gloucester area. My passion for Zumba started from the very first Zumba class I attended and has kept growing ever since. With the encouragement of my Instructor, I finally decided to become an Instructor myself in June 2011, with the desire to help improve the happiness and health of others and to share the joy and excitement that Zumba gives me. I have always enjoyed dance, from ballet to tap and street dance to salsa. However, I am by no means a professional dancer. But this is the beauty of Zumba; it’s for all shapes, sizes and ages, even if you don't have any dance experience. With easy-to-follow choreography, all you’ll need to do is follow my lead. I try to put as much energy, enthusiasm and fun into every class to create a party-like atmosphere, a place where people can lose themselves and just be happy. The greatest reward for me is to see the enjoyment on people's faces during my classes and watching them grow in self-confidence. The fact people leave my classes with beaming smiles and a spring in their step makes my job worthwhile and highly satisfying, not forgetting the stories of weight loss and improved health. So what are you waiting for? 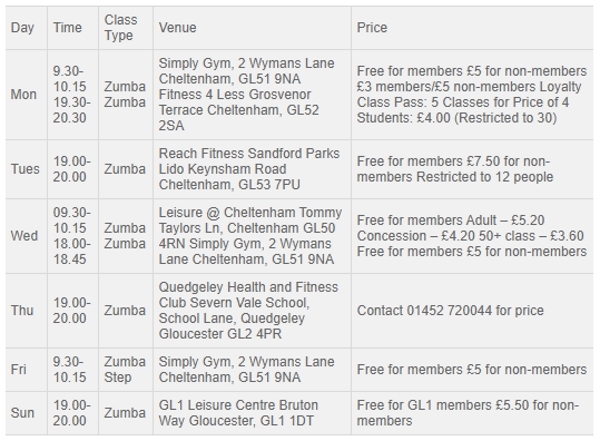 Ditch the workout, click on my class timetable and join the party! I look forward to seeing you in class, and don't worry if you’re a beginner as we all have to start somewhere. Before you know it you'll be fighting for that space in the front row! "The fact people leave my classes with beaming smiles and a spring in their step makes my job worthwhile and highly satisfying, not forgetting the stories of weight loss and improved health"